A first for me--I have a project in the newest issue of Fat Quarterly, which is available today. Subscribers need only to log into their accounts to find the links to this issue. Otherwise you can purchase it here. When I made the project for Modern Patchwork (which reminds me--I haven't even shown you the quilt in that magazine yet, and it's one of my favorites! ), I was in a braided herringbone kind of mode. My project in Fat Quarterly is a pillow called Holiday Herringbone. It requires only one small segment of braid, and it was such fun to work with Laurie Wisbrun's latest Christmas line, Holiday Sweet Tweets. Here is the pillow, which has the easy-to-do look of a Christmas ornament. Since the colors of this fabric line are not the classic red and green, the pillow can be easily transformed for use all through the winter months by eliminating the half square triangles that give it the ornament look. I used an exposed zipper technique for the back. It's my favorite way to make a pillow back and the tutorial is here. 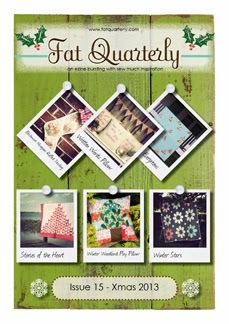 Head on over to Fat Quarterly and get your issue today! Kudos to you! Looks like a cool project. How fun to see the Christmas issue it out. Congrats Cindy! What a great creative pillow. Congratulations, Cindy! You are on a creative roll, girl!! Great job. Gorgeous cushion! We're like pattern twins! I have one in this issue too (and think we both have a block in another fab mag too!). Congratulations! This is a great Christmas cushion! Congrats once again! This is just the cutest pillow. Aha!! I knew it! Is this the secret you've been keeping? I saw that in the issue today and immediately did the happy dance like Will Ferrell in Elf. "That's Cindy!! I know her... I KNOW her...!!" Congrats! Wow!! Congratulations!! I love the pillow and the cute ornament look to it. And change the colors and add a leaf or two and it's a perfect apple pillow for the teacher gift. You are so clever and interesting in your designs! Way to go!! WooHoo!!! :) Elizabeth, who has returned but is still doing laundry and grading and looking forward to tomorrow when she can relax! What a great pillow!! Your design really does look like a big Christmas ornament!! I love the exposed zip backing too. Congrats Cindy. It's a very festive pillow. Can't wait to see the Modern Patchwork quilt. Congratulations Cindy! I was so excited to see your project when I downloaded my issue. Can't wait to try and make this pillow...a first for me. Well congratulations! I'm lately seeing you here, there, and everywhere in quilting publications. How fun for you! I hope you're earning a little stash money too. Your ornament pillow is great, and thanks for the link to the open zipper tute.